A company that converted a former Pennsylvania steel mill into a data center recently brought online the first set of data center modules in the facility. Taking an unusual approach to modular data center design, Keystone NAP is stacking custom shipping-container-like modules three-high. The approach takes advantage of the building’s unique physical characteristics and maximizes the use of real estate. “In order for us to best use the space, we wanted to have multiple levels … inside the building,” Shawn Carey, the company’s co-founder and senior VP of marketing, said. Modular data center design can mean several different things. It could mean using modular components that come together to form the building, which is the approach Facebook has used. It could also mean using modular electrical and mechanical infrastructure components. In Keystone’s case, modular means shipping entire container-like modules manufactured at a remote factory to the site for quick deployment. Used by enterprises and some data center providers, the value of this approach is in being able to deploy data center capacity quickly and in small increments instead of spending a lot of money upfront to build infrastructure that supports a lot of capacity, most of which may sit unused for years. Keystone collaborated on design of the modules with Schneider Electric, which manufactures and supplies them to the data center provider. Custom elements of the design include hot-aisle containment, high rack density (22 racks per module), and the ability to stack them on top of each other. Schneider delivered the first KeyBlock to the location earlier this year. A single stack consists of six modules (two stacks of three adjacent to each other). The first six are up and running in the facility in Fairless Hills, but the building can accommodate up to 100. That’s in addition to expansion space on the property, which can accommodate 50 more if necessary. “We’re continuing to innovate and evolve the design for each phase, and the size could shift smaller or bigger as we need to,” Carey said. All six modules that are already on site have been leased to customers, but he declined to name them. The customers are in the financial services, network services, and managed services businesses. The reason Keystone management decided to stack data center modules on top of each other was because the building was long (1,000 feet) and fairly narrow (60 feet) but had high ceilings (60 feet). Stacking modules was an easier alternative to building out multiple stories in the building. The building’s five-foot-thick foundation is strong enough to support that kind of weight. Besides the weight of the modules themselves, some customers, according to Carey, are bringing in extremely heavy custom high-performance computing gear. Power density and the building’s power capacity allow for high-density computing equipment. The modules support up to 400 watts per square foot, and the building’s current total power capacity is 32 MW, Carey said. Schneider manufactures the modules at a factory in North Carolina and delivers them on site for assembly. It takes about 90 days between the time a customer signs a contract with Keystone and the time they can start bringing in their IT equipment. There was a lot of skepticism in the data center industry about this kind of modular data center build-out when it started. 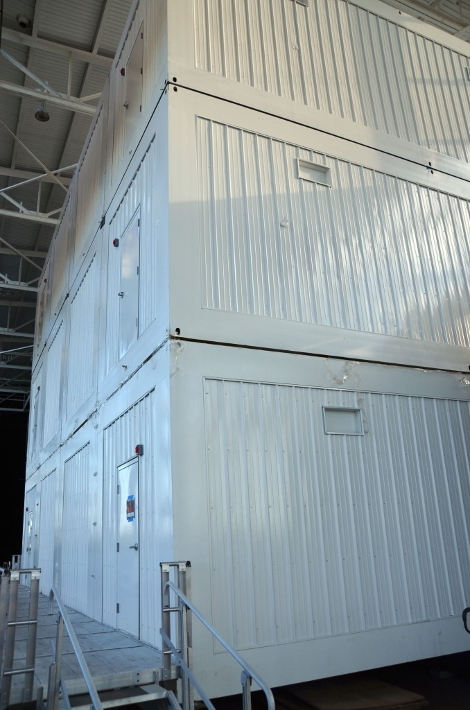 But the use of prefabricated modular data centers has been growing steadily. A recently published report by Research and Markets estimated that the modular data center market will grow from $8.37 billion this year to $35.11 billion by 2020. Being able to deploy data center capacity quickly and matching the size of the deployment to the requirement at a certain period of time are big advantages in the capital-intensive data center business, and modular data centers provide both of those abilities.